Under the auspices of the Comité aviseur sur l'amiante au Québec (asbestos advisory committee), the sub-committee on the epidemiology of asbestos-related diseases reviewed the available epidemiological data on these diseases in Quebec. The sub-committee also conducted various studies to fill in certain gaps identified during the analysis of available data. The findings that have been summarized here show a statistically significant increase in the incidence of mesothelioma of the pleura among Quebec men between 1982 and 1996. Statistical projection suggests that this increase might level off in a few years, but this is not certain. Quebec men and women also show significantly higher rates of mesothelioma of the pleura than men and women in the rest of Canada and in several other countries. This clearly points to the necessity of monitoring the evolution of this cancer in Quebec in the coming years, especially to see whether or not the increase levels off and to describe the geographical distribution of cases. Moreover, these findings show the relevance of continuing international comparisons. 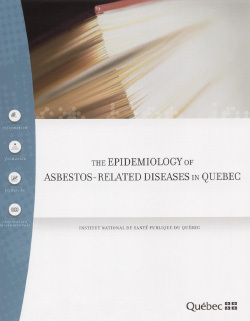 Matching cases of asbestos-related diseases of recognized occupational origin to cases observed in the general Quebec population reveals two principal findings: cases of occupational origin may be far underestimated, and Quebec does not have an adequate surveillance system for asbestos-related diseases that includes information on the diseases, on exposure to this fibre, and on the populations at risk. In terms of the relation to work, the number of workers with an asbestos-related disease of recognized occupational origin also increased over the last decade. These claims are mainly from workers in the construction industry and that of the repair and maintenance of asbestos-containing products or structures. The increased number of demands was also more striking in these two industries. The number of claims from mine workers appeared stable. However, it might decrease in coming years following the lowering of the exposure standard to 1 fibre/ml in 1990. These data showed processing workers also made claims. The overexposure to asbestos documented in that industry as well as in construction88 and the reported incidences of standards being exceeded in mines demonstrate the importance of properly monitoring the exposure and state of health of workers in future. The under-estimation of lung cancer and the poor recognition of the link between asbestos work and this tumour indicate a need to continue and to strengthen prevention, health promotion, and education among doctors, workers, and employers on this matter. The same holds true for other asbestos-related diseases. In terms of the relation with the environment, information is more scarce. The study of women diagnosed with mesothelioma in the town of Thetford Mines showed an increased risk of this cancer with an increase in their occupational and domestic exposure. It also suggested a possible impact from environmental exposures to asbestos.